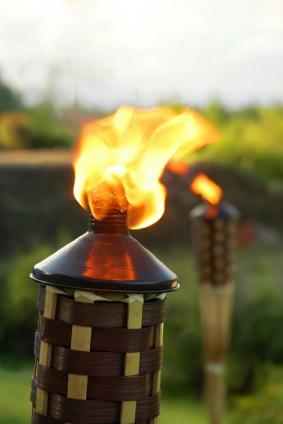 Get creative with Survivor party ideas for your next bash. If you and your friends are fans of the reality TV show, Survivor, then plan your next party around the theme of island survival. A Survivor party can be fun for both children and adults. By planning ahead, you can be sure all the details are in place for your party and all your guests will be happy. This theme can work well for birthdays or other special occasions or you can even hold a party during an episode of the TV show. The first step is sending out the invitation. Make sure you create an invitation that will prepare guests for a Survivor party. There are many sites online, such as Party 411, with specialty themed invitations, or try your hand at creating one yourself. In the invitation, you can encourage your guests to come dressed in Survivor-style clothing. Since your party will most likely include games, make a list of your guests and divide them into teams. Each team will be a separate tribe. Give each tribe a unique name and hand out colored bandanas to designate who is on each tribe. Immunity challenges such as last one standing, digging for treasure or even a limbo contest. Have prizes to hand out for the winners of each challenge. Shell necklaces or CDs of Caribbean music are inexpensive and fun. Another idea is to set up a barbeque and allow guest to cook their own food like they are on the TV show. Have items prepared beforehand that guests can just throw on the grill. A pig roast is another food option that is fun and goes along with the island theme. There are endless Survivor party ideas to consider. Why not add some special touches to your party such as playing steel drum music in the background or even showing recorded episodes of the TV show. The possibilities are endless. Remember to be creative and have fun and your party will be one that your guests will never forget!